Natural products such as honey have been used for centuries against infection and are a staple of folk medicine. Today, interest in honey as an alternative to antibiotics is high in both countries in the developing world - where the fresh honey is readily available - both in the West - in which the struggle to antibiotics is increasing. Tobias Olofsson C, of the University of Lund (Sweden) and colleagues have identified a unique group of 13 lactic acid bacteria present in fresh honey. The bacteria produce a myriad of antimicrobial active compounds. These lactic acid bacteria were tested on major pathogens of human wounds, such as Staphylococcus aureus (MRSA), Pseudomonas aeruginosa and Enterococcus (VRE). When the lactic acid bacteria have been applied to pathogens in the laboratory, these were all neutralized. While the effect on human bacteria has only been tested in the laboratory so far, lactic acid bacteria have been applied directly to horses with persistent wounds. Lactic acid bacteria were mixed with honey and applied to ten horses, whose owners had tried several other methods to no avail. All wounds were healed horses mixture. "We showed a strong antimicrobial activity of each symbiont and a synergistic effect, which has resisted all pathogens tested," say the authors of the study "The symbionts produce a host of active compounds that remain in varying amounts in mature honey. 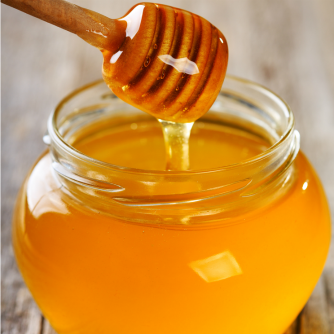 You just have to investigate the beneficial effects of honey on human infections. "